The harvest, manual, are carried out plot by plot, at perfect maturity. The grapes undergo a first sorting in the vineyard, done by the grape harvesters. In the vat room two sorts are made, before and after the separation of the stalks, to optimize the quality of the fruits. before a period of maceration of the juices with the skins, for two to three weeks. Then comes the draining of the wines of gout and the pressing of the marcs whose juices are carefully set apart. The second fermentation – malo lactic – is then carried out, according to the quality of the batches of wine, in barrels or in vats, varietal grape variety. The harvest is sung in oak barrels (50% new wood). when racking “at the end” made about every three months. the complexity allowing them to constitute wines of guard capable of improving over time. The estate can produce up to 100,000 bottles. A second Pomerol AOP wine, L’Hospitalet de Gazin, was created in 1986 to reserve the best of the harvest for Château GAZIN. 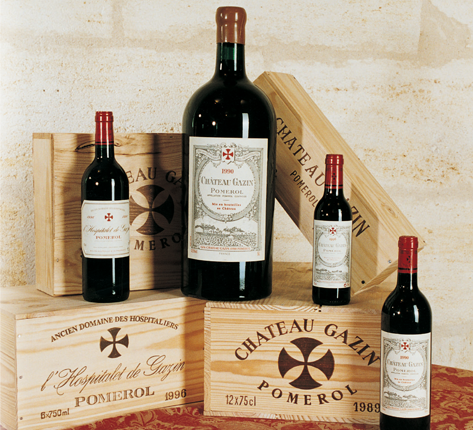 at the property, the wine is shipped in wooden boxes around the world by the Bordeaux trade. 86% of Château GAZIN's production is aimed at foreign amateurs.